“If you hold to my teaching, your are really my disciples. Look what Jesus is doing here: Jesus is talking to Jews “who HAD believed in him,” but there is an indication, from verses 31 -36 they really do not believe. Your see, they, rather than believe, argued with him about how to be a free disciple. Actually they couldn’t see their own enslavement to sin and death. A lot of people are like this in our day; yet, the actual disciples did indeed eventually … well … disciple. And unlike those first century Christ-Followers, at least in our western culture, we clearly are NOT following through in our disciple making. This is a problem because that is precisely what authentic disciples do. How do we experience, and share, this highly important freedom causing life changing “stuff, ” which Jesus wants to provide? We can do so by being disciples who make disciples. I say this important because Jesus teachings are what makes us free, and these teachings are used by the Almighty to form mere believers into disciples. This is one real big reason I wrote Rock-Solid Living In A Quicksand World – Rewind. 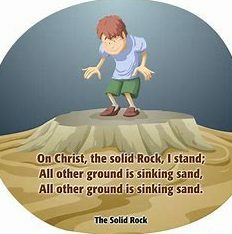 It is written to teach Jesus teachings in this highly conflicted USA and western culture; additionally, it is written to give Pastors, Teachers and Evangelist a tool to help folks actually begin to experience rock-solid living in a quicksand world. All each leader needs to do is get a few people together, have each one read each chapter, and then — as a group — reflect on what Jesus is saying. I am fairly certain that some will be very surprise how relevant are Jesus words for our crumbling culture. Check out the video below, and share it with every friend, relative, associate and neighbor that you know. Share it with you Pastor or other Church leaders. My heart breaks for American and for the rest of civilization … especially western civilization. Help me get the word out to help disciples make disciples. Help me share the fantastic news of how each person can know the truth and be set free.